Calcium is the fifth most abundant element by mass in the earth’s crust, where it is found as a component of many common minerals. Calcium carbonate is one of the most common compounds of calcium, found widely as the primary component of limestone. For millennia, humans have used limestone directly as a building material, and additionally to produce lime, which itself was widely used in building materials such as mortar. As a chemical agent, lime found historic uses in arenas such as agriculture, tanning, and glassmaking. Other widely known and used calcium minerals include marble, a type of rock resulting from the metamorphosis of limestone, and gypsum, which is composed of calcium sulfate. Though calcium is ubiquitous in these mineral forms, the metallic form is so highly reactive that it is not found in nature, and was not produced chemically until 1808. Sir Humphry Davy accomplished the production of a calcium-mercury amalgam through electrolysis of lime in the presence of mercury oxide, and from this was able to distill pure calcium metal, which he named from the latin “calc”, meaning lime. Calcium mineral products are still widely used in building materials, as they have been for centuries. Limestone is no longer favored as a structural material due to its tendency to be eroded by acid rain, but the crushed stone is frequently used as a base material in road building. Marble, long used both to build structures and as a sculpture medium, remains in use for these and other applications. Calcium hydroxide, often termed “builder’s lime”, is a major component of many mortars, plaster, and stucco, while calcium oxide, or quicklime, is essential for the making of cement. Gypsum is also often found in both plaster and cement, but is most notable for use as gypsum board, known more commonly as drywall. Calcium and calcium compounds are incredibly important as chemical agents. Calcium oxide is used as a flux to remove impurities during steel refining, a use that accounts for almost a third of lime consumption. Calcium hydroxide is widely used in mining and metallurgy, both as an active agent in extracting metals from their ores and as a means to neutralize acids produced by the ores or used in their processing. Calcium hydroxide also finds use in water treatment, as well as in flue gas desulfurization, where it reacts with gaseous sulfur pollutants, preventing their release into the air. Incidentally, this use results in the production of synthetic calcium sulfate, which can be used in the manufacture of gypsum products such as drywall. Lime is additionally important in processing wood pulp into paper, refining sugar, making glass, and producing a number of other important industrial chemicals. Additionally, hydrated lime is used in drilling fluid for oil and gas drilling, and serves as a source of both calcium and alkalinity, important for removing soluble carbonate ions and controlling corrosion. Calcium plays many essential roles in biological systems, and its compounds are therefore have important agricultural and medical uses. Agricultural lime consists of pulverized limestone, and is added to soil as a source of calcium and magnesium for plants, as well as to neutralize acidic soils. Calcium carbonate is used as an antacid, a calcium supplement, and as a phosphate binder in the treatment of patients with renal failure. As a safe and relatively inert compound, it also is used as a filler in tablets and other forms of pharmaceuticals. Additionally, hydroxyapatite, the form of calcium found in bones, is often used to coat medical implants in order to promote integration of the implant with existing bone. There are many other calcium compounds that play important roles in industry. Calcium hypochlorite is a common bleaching agent. Calcium phosphate is used in the production of fertilizer. Calcium carbide was once used in carbide lamps, but today is mostly important for production of acetylene, from which PVC is mate, and in steelmaking. Calcium phosphide is found in pyrotechnic applications such as fireworks, flares, and incindiery bombs. Calcium chloride is a dessicant and deicing agent, while calcium silicate is used as an alternative to asbestos for high-temperature insulation. Heating calcium-rich limestones decomposes the carbonate, producing calcium oxide, or quicklime. The addition of water to quicklime produces calcium hydroxide, which is often termed slaked or hydrated lime. Most industrial calcium products use one of these as raw material, with the exception of those products that require the use of gypsum. Gypsum may be mined, or may be recovered from industrial processes where it accumulates as a byproduct. Calcium metal has comparatively few uses, but when needed is produced by mixing calcium oxide with fine particles of aluminum, and then heating the mixture in a vacuum. Calcium's primary commercial application is as a reducing agent in the production of other metals. In iron and steel production it is added to the melt to remove oxygen, sulfur and carbon. Calcium is also used in small doses in alloys of copper and beryllium. Various calcium compounds have wide application in food, pharmaceutical and cosmetics. It is also used in dietary supplements because it has been shown to improve bone and dental health. Calcium is available as metal and compounds with purities from 99% to 99.999% (ACS grade to ultra-high purity). Oxides tend to be insoluble. Fluorides are another insoluble form for uses in which oxygen is undesirable such as metallurgy, chemical and physical vapor deposition and in some optical coatings. Calcium is also available in soluble forms including chlorides, nitrates and acetates. These compounds can be manufactured as solutions at specified stoichiometries. Calcium is a Block S, Group 2, Period 4 element. The number of electrons in each of Calcium's shells is 2, 8, 8, 2 and its electron configuration is [Ar] 4s2. 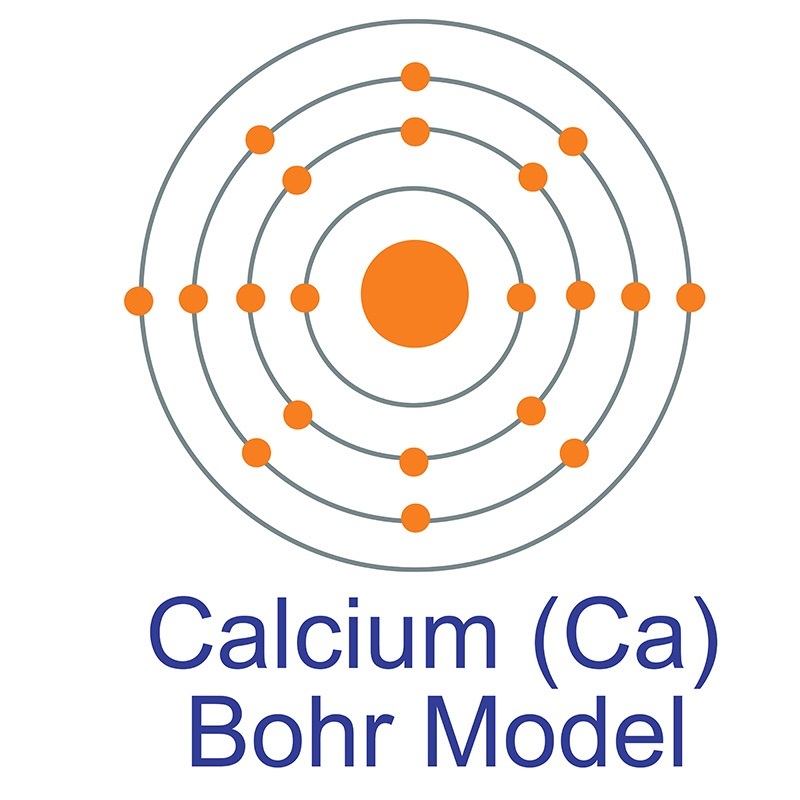 The calcium atom has a radius of 197.pm and its Van der Waals radius is 231.pm. In its elemental form, CAS 7440-70-2, calcium has a dull gray-silver appearance. Calcium is a reactive, soft metal that is a member of the alkaline earth elements. It is found in the minerals dolomite, gypsum, plagioclases, amphiboles, pyroxenes and garnets. Calcium was discovered and first isolated by Sir Humphrey Davy in 1808. The name calcium originates from the Latin word 'calics' meaning lime. Calcium is non-toxic and is an essential metal for living organisms. Safety data for Calcium and its compounds can vary widely depending on the form. For potential hazard information, toxicity, and road, sea and air transportation limitations, such as DOT Hazard Class, DOT Number, EU Number, NFPA Health rating and RTECS Class, please see the specific material or compound referenced in the Products tab. The below information applies to elemental (metallic) Calcium. Flammability (solid, gaseous): Contact with water liberates extremely flammable gases.